In early 2001, seven Southeast Huntsville churches envisioned a single, centrally located, organized, well-funded entity that could be developed to provide benevolent assistance to those in need and to relieve the individual church of this effort. In 2002, the Huntsville Assistance Program was designated a non-profit charity under the provision of Section 501 (c) (3) of the Internal Revenue Code, incorporated in the State of Alabama, and became a reality based in Huntsville, Alabama, under the governance of the Board of Directors. The Huntsville Assistance Program is now the largest non-government benevolent organization in Madison County. There are currently about seventy churches, of various denominations, that are members of HAP. These members provide the financial resources for our benevolent efforts, volunteers for our activities, food for our pantries, and representatives to our Governing Board. HAP maintains the Clearing House database where member and non-member benevolence providers can report assistance efforts and receive assistance information. This database determines client eligibility and prevents duplication of services. In 2009 HAP opened a satellite office in Toney, Alabama, to serve those in the northern part of Madison County. HAP’s primary goal is to help our clients have a better life and often give them hope when they have none. We believe in giving a “hand-up” rather than a “hand-out.” Paying their bills is not always the answer. We endeavor to meet many needs – whether they are emotional, financial, or spiritual. Each of our clients is interviewed in person, and we spend as much time as needed to “peel back the onion” to get to the core of that person’s particular problem. We may refer the person for financial counseling, marital counseling, drug/alcohol addiction, or medical assistance. We are a major referral source for services available within Madison County. All persons interviewed are encouraged to find a church family, regardless of their denomination preference. Gayla Kidd is a native Alabamian born in Winston County. The family moved to south Florida when she was 12; she returned to Alabama in 1983. She is a graduate of Wesleyan College with a degree in interior design. She joined HAP when it was in its infancy and has seen it grow from seven churches to over seventy. In her wildest dreams she never thought she would be the dedicated, God called, Benevolent Ministry Hometown Missionary she has become. Gayla not only endeavors to provide physical needs, counseling and the encouragement the clients need to become self sufficient but proclaims HAP as a front line warrior to bring the message of Jesus Christ to all who enter its portals. She works closely with other organizations involved in caring for people. H.A.P. is hosting their first training at their new location (Harvest Pointe) on March 9 at 9AM. Please fill out the form below so Gayla can contact you with further instructions and additional information. A mission effort currently in the planning stages is to provide comfort to patients and their families at Madison Hospital's Emergency Room, in the form of small gift packages with snacks, hygiene items, children's items, cards, etc. Fellowship will be offered as prayer or simply conversation. For more information, contact Megan Lawrence. Mark your calendars for April 6 and September 7 to help at Outdoor Church! This three-day retreat weekend for spiritual renewal. Walk to Emmaus is an opportunity to experience Christ in unexpected ways. 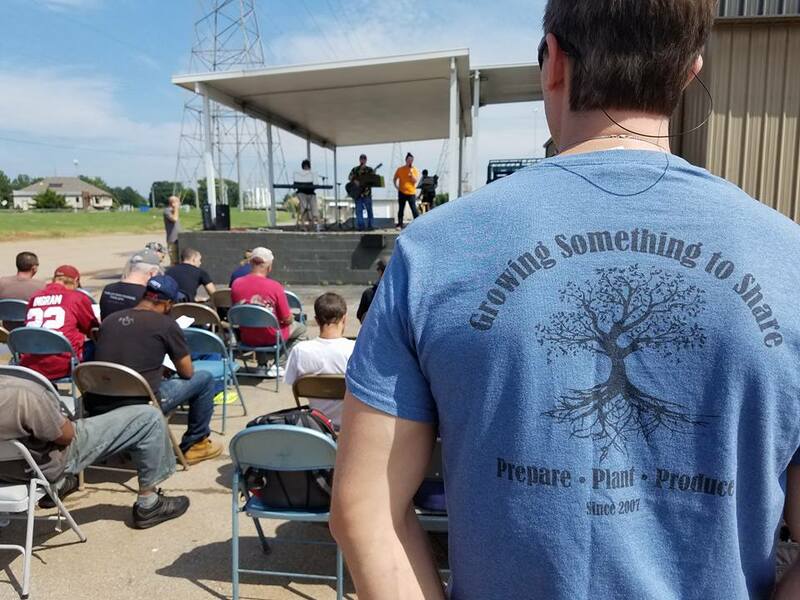 After completion of the weekend there are many opportunities to serve in related missions, including team participation for youth weekends and prison ministry. On the first Wednesday of every month, Harvest Pointe provides an afternoon Communion service for residents at Madison Village. The worship time is led by our pastor and includes a short message, singing, and a time of fellowship. Kids are welcome! For more information, contact Sandy McRae. CASA is a Huntsville-based organization that provides assistance for the elderly and homebound in the area. Harvest Pointe supports several programs, such as warehouse work, summer yard maintenance, and home winterization. Other opportunities include ramp building, community garden, and transportation help. The first Tuesday of each month is CASA work night. Please contact Craig Grabowsky for more information cgrabowsky@yahoo.com. Feed the hungry. Jesus commands you (Matthew 25:31-46). The second Wednesday of every month from 5:15 until 7:00pm, is an occasion for you to "work out your own salvation" (Philippians 2:12) in obedience to Jesus Christ. The Salvation Army's Mobile Canteen (a complete kitchen on wheels) travels to various stops in Huntsville to provide meals for the needy and homeless. The Canteen operates every day, rain or shine, and Harvest Pointe has the responsibility for its operation on the second Wednesday of the month. Harvest Pointe is also an "on call" church when there is an unscheduled need to operate the canteen. Three or four volunteers are required, one of whom is registered as a Salvation Army driver. Personnel meet at the Community Kitchen/Emergency Shelter located at 305 Seminole Drive in Huntsville at 5:15pm, and proceed to three designated locations to serve free meals to neighbors in need. Typically 50 to 75 meals are served, and the mission is completed by about 7pm. This is a very rewarding experience, for adults and older youth. To volunteer for a particular date, or as a stand-by volume, or for more information about this program, contact Jack Lawrence or Pete Davidoski. Harvest Pointe is proudly serves along side First Stop to assist in reaching out and loving on our homeless community. Join us every 5th Wednesday at 11:30 am as we worship and reach out to those who need our love and support. Contact Jack Lawrence for additional information. If you would like to volunteer or donate to First Stop, Inc. Click here for their contact information. -Providing them life-management-skills training to promote continued stability and growth. Many elderly and homebound individuals who have no caretaker to prepare their meals depend on the "Meals On Wheels" program; however, that program does not operate on holidays. 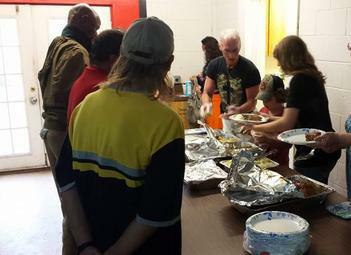 Families at Harvest Pointe take a hearty serving of their own Thanksgiving dinner to share with these folks. Please see Jack Lawrence for more information. A project of Samaritan's Purse, shoebox gifts are filled with age-appropriate items for boys and girls around the world, which then opens doors for evangelism and a connection to the local churches. Instructions will be available on the missions table. This is an excellent opportunity for youth and children to get involved in a meaningful mission! Plus, you can track where your shoebox goes! Please see Sandy McRae for additional information. The Red Kettle Campaign is the Salvation Army's largest fundraiser. The monies raised are used to bless the lives of others. The simple act of ringing a bell will help provide food and clothing, help at risk youth, and much more. Please see Jack Lawrence for additional information. Harvest Pointe provides support for this Huntsville "family" of diverse disabled adults who are ineligible for government assistance. Projects at the group home range from house repairs and improvements to providing meals, and always include a rewarding time of fellowship with the residents. For more information, contact Jason and Rachel Corrigan. Prior to the start of the school year, local churches provide the funds to furnish school supplies for low income children in Madison City and County schools. This is an opportunity anyone, especially for our youth, to join other groups from the area which team together to assemble the contributed items into backpacks. For more information, contact Debra Moder or Lindsay May. Aid to Inmate Mothers is a program concerned with maintaining the bond between incarcerated mothers and their children through monthly visits and special projects. Harvest Pointe has helped with providing children's books and tapes, and may soon assist by providing transportation for children in this area. We plan to take a team to Alberta, Canada, to work with the Cree Indians on the Montana and Louis Bull Reserves on July 6-13, 2019. Work includes Bible School, sports camps, outreach to youth, assistance for elderly, and facility improvement projects. A three day spiritual retreat for youth, equivalent to the Walk to Emmaus. Chrysalis is a very empowering spiritual event with an opportunity for youth to minister to other youth. There are two events conducted each year; for boys, over the Memorial Day weekend, and girls, over the Labor Day weekend. For more information, contact Jack Lawrence. Harvest Pointe is a strong supporter of this crisis pregnancy center that saves lives on a daily basis! Activities include the "baby bottle" program fund-raising, kitchen and serving staff at the annual banquet, building and grounds maintenance, and providing volunteer staff (counseling). Kairos is an ecumenical Christian ministry to prisoners, providing a three-day spiritual experience for inmates. Our local involvement in Kairos is at Limestone Correctional Facility, Decatur Work Release, and Tutwiler Women's Prison. Besides serving as team members, individuals support by providing cookies, buying meal tickets, providing agape, or through prayer vigils. For more information, contact Jack Lawrence or Tami Grabowsky. A team of volunteers is needed to work at the central packaging and shipment facility, preparing shoeboxes for Operation Christmas Child. These shoeboxes are gathered from all over the Southeast US for shipment overseas. Lodging is provided at no cost.